You're looking at LifeHand2, a prosthetic limb that allows amputees to feel sensory-rich information in real time. The futuristic device, which transmits signals to nerves in the upper arm, is not yet commercially available or portable — but it represents an important proof-of-concept as researchers work to create more life-like assistive devices. To date, researchers have only been able to simulate the sense of touch with prosthetics in lab animals. By using a technique called intracortical microstimulation (ICMS), researchers from the University of Chicago successfully identified brain patterns associated with touch in Rhesus macaques, and then projected those sensations to specific areas of their bodies. But now, using a slightly different method, Silvestro Micera and his team at EPFL (Switzerland) and SSSA (Italy) have done it for humans — or one human to be more precise. Dennis Aabo Sørensen will go down in history as the first cyborg to receive an artificial limb that allows for the sense of touch. When using the new hand, and while wearing a blindfold, the 36-year-old Dane could detect how strongly he was grasping, as well as the shape and consistency of the various objects he picked up. "I could feel round things, and hard things, and soft things — and the feedback was totally new to me," said Sørensen. "Suddenly, when I was doing the movements, I could actually feel what I was doing instead of looking at what I was doing." 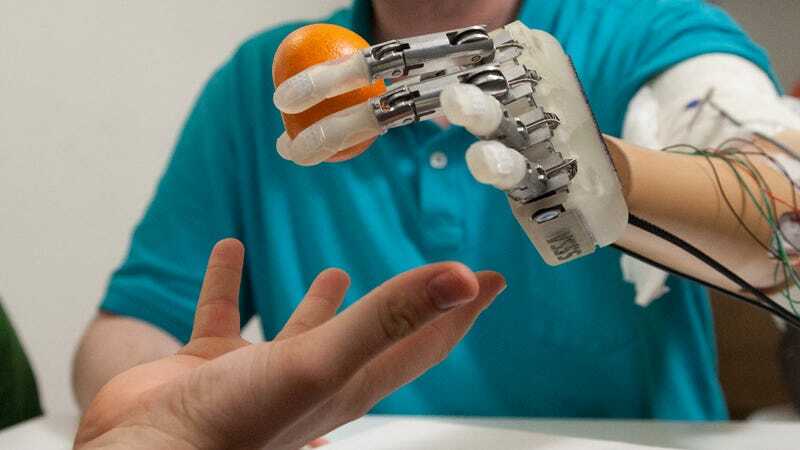 To make the hand work, the researchers equipped the artificial hand with sensors that detect information about touch. They achieved this by measuring the tension in artificial tendons that control finger movement, turning these measurements into an electrical current. The level of force could then be measured when the hand was used to grasp an object. But the central nervous system isn't designed to understand signals like these — they're far too coarse. So, to make this information meaningful, Micera and his team scripted algorithms that can convert these electrical signals into impulses that the sensory nerves can properly interpret. The sense of touch was achieved by sending the digitally enhanced signal through wires into four electrodes that were surgically implanted into the remnants of the nerves in Sørensen's upper arm. He lost his hand nine years ago in a fireworks accident that left the nerves in his arm intact. "We were worried about reduced sensitivity in Dennis' nerves since they hadn't been used in over nine years," noted Stanisa Raspopovic, first author and scientist at EPFL and SSSA. But these concerns disappeared as the scientists successfully reactivated Sørensen's sense of touch. "This is the first time in neuroprosthetics that sensory feedback has been restored and used by an amputee in real-time to control an artificial limb," says Micera. A little over a year ago, Sørensen underwent surgery in Rome to have transneural electrodes implanted into the ulnar and median nerves of his left arm. After 19 days of preliminary tests, the researchers connected the prosthetic to the electrodes — and to Sørensen — each day for a week. These ultra-thin, ultra-precise electrodes relayed extremely weak electrical signals directly into Sørensen's nervous system. The electrodes were painstakingly designed such that they would continue to work even after the formation of post-surgey scar tissue. It also marks the first time in history that electrodes have been transversally implanted into the peripheral nervous system of an amputee. The researchers caution that a sensory-enhanced prosthetic is still years away from being commercially available. Moving forward, the researchers will work to miniaturize the sensory feedback electronics for a more portable version of the prosthetic. They also want to fine-tune the sensory technology for better touch resolution and increased awareness about the angular movement of fingers. The researchers had to remove the electrodes from Sørensen's arm after one month owing to safety restrictions imposed on clinical trials. That said, the scientists are confident they could remain implanted and functional without damaging the nervous system for years. So, it'll be a while yet before we see the kind of hyper-realistic cybernetic hands portrayed in science fiction, but between this and other breakthroughs, like artificial skin containing functional blood vessels and lymph capillaries, and mind-controlled prostheses, it's clear we'll get there soon. Read the entire study at Science Translational Medicine.